JWV Archives - Jewish War Veterans of the U.S.A.
A high-quality education, a decent paying job, a life that one can be happy with and proud of. These are things that everyone wants. For veterans, however, it’s what they’ve earned. In late March, the non-profit organization Veterans Education Success hosted a meeting be-tween numerous veteran’s organizations—including Jewish War Veterans, and Thomas Corbett, Air Force veteran and disillusioned former president of an ITT Technical Institute campus. The purpose of the meeting was to make the numerous veterans’ affairs groups in attendance aware of the predatory methods employed by for-profit educational institutions. If any of their veteran members were targeted by these institutions in the past or are targeted in the future, these organizations now have additional knowledge and resources they can employ to help victims recover. If you watched enough TV in the early 2000s, you might recall some commercials for ITT Technical Institute. The commercials of this “institute of higher learning” featured your standard middle class, middle American pursuing the American dream and looking for a brighter future and a means to care for their family. The commercials made enticing offers that promoted the vision that a degree from ITT was a calling card to a brighter, more rewarding future. But ITT Technical Institute was a for-profit college, and an exceptionally predatory one at that. ITT Tech corporate targeted people from all walks of life but was especially zealous in its targeting of members in the veteran community. Thousands of veterans sought the fulfilling educational programs that ITT Tech seemed to offer and used their GI bills to make sure they were able to receive what ITT Tech was offering. Thanks to federal grants and loans, a sizeable number of the student body was lower class or of a military background. The intention of ITT Tech and other similar predatory for-profit schools was never to give students a high-quality education, but rather to siphon as much money out of them as they could. The cost was higher than advertised, the adjunct professors could hardly be relied upon to be knowledge-able in the subject they taught, school credits could not be transferred, and since anyone could attend ITT Tech if they had a pulse and a GED, the degrees became largely worthless. In addition, the extraordinarily high cost of the school meant that many had to take out loans to afford it, putting in financial peril many of those who assumed they would be virtually guaranteed a high paying job when they graduated. One of the ways ITT Tech and other predatory educational institutions reveals its despera-tion for tuition payment is an excessive persistence to enroll a student. If loans need to be taken for the student to be able to afford enrollment, then so be it. These institutions will do anything they can to get potential students to sign on the dotted line, and excessive persistence on the part of an educational institution should be considered a red flag. The scheme didn’t last forever, and pressure from the government and from angry current and former students eventually caused the bankruptcy of ITT Tech in 2016, and the $500 million student debt relief settlement in 2018. It is worth noting that even in its death throes, ITT Tech’s incompetence and utter disregard for its students and employees was palpable. Initially promising that all students still enrolled at the time of bankruptcy would be able to complete their education, students, teachers, even administrators of campuses found the doors of those campuses permanently locked with no warning. ITT Tech was and is no more. However, for-profit “educational institutions” still exist, still prey on unsuspecting students, and may soon see a growth in numbers due to the Trump administrations plans to weaken protections for students. Fortunately for the veteran community, there are organizations dedicated to helping those who have fallen victim to predatory targeting by for-profit education institutions. If you believe that you or someone you know has been predatorily targeted by a for-profit institution due to your military status, or to get information on student loan forgiveness programs, don’t hesitate to contact one of the many non-profits like JWV and the Veterans Education Success that can and want to help you. Each year since then, volunteers, including those in their 70’s and 80’s, work on non-combat IDF bases throughout Israel doing support work for a one to three week period. Although such volunteers are civilians and not members of the IDF, they are led by madrachot, who are IDF soldiers. Volunteers work on a Sunday through Thursday schedule doing work such as quartermaster/supply work, base maintenance, maintenance and equipment repair, kitchen work or construction. Weekends are for traveling, sightseeing and visiting family and friends. There are frequent interesting lectures and question and answer sessions with Sar-El and military personnel. Of course, you work side by side with IDF soldiers, many of whom are now proud owners of Boston Red Sox pens. Alas, there are no JWV pens! The free facilities are spartan and not a little nostalgic. Volunteers live in communal barracks in sleeping bags on cots with communal bathrooms. There is no central heat or air conditioning. Hot water is at a premium. Men and women are housed separately, including married couples. The mess hall food, however, is filling. In December, 2015, over thirty-three years after I had rashly made a promise to the General, I spent two weeks for Sar-El in an army base in central Israel. Better late than never. We were a group of fourteen and worked very hard collecting, inventorying and crating military supplies, particularly tank maintenance equipment and parts. One of our speakers told us that Sar-El volunteers have unusually high productivity, presumably because they are motivated and because they only have a very short time commitment. There is both an initiation ceremony, during which the Sar-El epaulettes are placed on you, and a graduation ceremony, during which you receive the Sar-El pin and a Certificate of Appreciation. The makeup of Sar-El volunteers is diverse. About 4,000 volunteers come per year and in 2014 they were from 51 countries. Tellingly, in 2014, France had the most volunteers with 1,161 with the U.S. having 938. France, of late, has the most people making Aliyah. In our group of fourteen, there were volunteers from Canada, England and South Africa, as well as the United States, and we were joined for a brief period on our bus by a small group from Hungary and Holland. There was also a Christian in our group, who is an avid supporter of Israel. Most of my Sar-El volunteer group were repeats and one woman in our group was there for the 13th time. The group bonded and there was a great sense of camaraderie and friendship, as well as a lot of laughs. There are no upper age limits for volunteers, and there were two volunteers in our group in their 70’s, but one should be relatively fit and healthy and willing to work. I was given one of the daily honors of raising the Israeli flag on the Israeli base followed by the singing of Hatikvah. My ancestors (and General Davidi) would have kvelled. (Many of the facts above are taken from the Sar-El website). You can tie in a Sar-El experience prior to the JWV Israel trip, as did Membership Chair Barry Lischinsky, or you can do it independently, as I did and as National Quartermaster Nelson Mellitz did. Hundreds turned out for a vigil Tuesday night at the Hebrew Cemetery of Fall River where 59 gravestones were vandalized with hateful, anti-Semitic messages. The vigil attendees stood shoulder to shoulder, sending a clear message to the vandals who scrawled anti-Semitic graffiti on the headstones and any anti-Semites considering following their footsteps. Hateful phrases on the headstones such as “expel the Jews,” along with other anti-Semitic words and phrases, should be condemned as unacceptable. The message for the individual(s) who wrote these hateful words are simple, “We will not be expelled, and we will not remain silent,” Jeff Weissman, Jewish War Veterans member and cemetery caretaker, also spoke at the event. Additionally, Junior Vice Commander Stephan Bloch; Department Commander Sanford Gorodetsky; Judge Advocate Howard Lipsey; and Senior Vice Commander Ira Fleisher were in attendance at the vigil, as well as officers of the department of Rhode Island. We are proud of these members of the JWV who attended the vigil, and to all who lend their support in a line of solidarity against anti-Semitic hate. Members of the Jewish War Veterans joined with the First Reformed Church of Schenectady and nearly 100 area attendees in the Clark Poling Chapel to honor Rev. Charlene Robbins as the 54th recipient of the Four Chaplains’ Brotherhood Award Sunday, February 24. 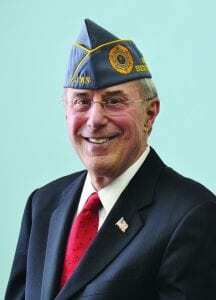 Albany Post 105 of the Jewish War Veterans has led the effort to recognize a local member of the community since 1966 in honor of the value of selfless service of the Four Chaplains. Clark Poling was one of the Four Chaplains lost in the North Atlantic in February 1943 during the sinking of the troopship Dorchester. Poling had served the faith community at the First Reformed Church before entering military service as an Army Chaplain in World War II. Charlene has led a life of service to others in various forms since her ordination on September 9, 2001 from the Holistic Studies Seminary Institute in Albany, first ministering to and comforting first responders and aid workers following the terror attacks at the World Trade Center on 9/11. “Charlene inspires us in her devotion to others, and in particular her focus on serving veteran organizations,” said Fred Altman, JWV Albany Post 105 Commander. Robbins is also a Gold Star Mother to Army Staff Sergeant Thomas Robbins, who died in action in Iraq on February 9, 2004, attempting to save the lives of his soldiers during a mortar explosion. It was the intersection of these two elements of her life that inspire Charlene’s efforts today. “All my life, I just wanted to be that person to help others,” Robbins said. She was recognized in 2005 as a grand marshal by the City of Albany Memorial Day Parade, participating on her son’s behalf. Her introduction to the wider veterans’ community 14 years ago sparked her action and support, bringing spiritual leadership, empathy, comfort and peacefulness to the many veteran and civic events she supports. She is Chaplain of the Tri-County Council of Vietnam Era Veterans as well chaplain for countless community programs, including the Albany County Honor-A-Veteran program, the Albany County Honor-A-Living Veteran program, Albany High School Junior ROTC, the City of Albany Memorial and Veterans Day parades and the Town of Colonie annual Memorial Day Service. The Four Chaplains Brotherhood Award exists to further the cause of “unity without uniformity” by encouraging goodwill and cooperation among all people. The non-denominational award honors people whose deeds symbolize the legacy of the Four Chaplains. “Today’s honoree, in addition to being called Reverend, has devoted her life’s work and passion in a manner that exemplifies the exceptional character of the Four Chaplains,” Altman said. “When you read the story of these Four Chaplains, it really makes you take pause, to reflect on those values that come to the front in difficult times,” said Congressman Paul Tonko. Tonko presented Robbins with a proclamation, prepared by himself and Congressman Antonio Delgado, representing the region and was joined by a litany of elected officials, including New York State Senator James Tedisco, Assembly representative John McDonald, City of Albany Treasurer Darius Shahinfar, and New York State Division of Veterans Affairs Deputy Director Jason Chakot. All joined in the praise of Robbins’ presence and support to the veterans’ community with state and local proclamations, including the City of Albany declaring February 24 as Charlene Robbins Day. The vision of the Four Chaplains Award is to impart the principles of selfless service to humanity without regard to race, creed, ethnicity, or religious beliefs. “I thank and commend the Jewish War Veterans for bringing us together each year for this event, to retell the tale and honor those in our community who live up to the ideals of those Four Chaplains,” Tonko said. First held in 1966, the Jewish War Veterans of the Capital District have recognized civic leaders, community organizers and issue advocates, educators, healthcare providers and clergy for their humanitarian efforts that convey the spirit of the Four Chaplains. The Jewish War Veterans have posts in Albany, Schenectady and Saratoga Springs. For more information or membership, visit www.jwv.org. The Jewish War Veterans Legacy Program seeks to ensure the permanence of L’Dor V’Dor, from generation to generation. JWV has a long history of protecting veterans’ benefits, promoting community, ensuring our armed forces may serve free of bigotry and prejudice, and preserving the Jewish American military legacy. We need your help to ensure that JWV’s mission continues long into the future. If statistics are correct, there are approximately 13 million Jews in the world. That works out to about .2% of the world’s population. Jews make up only 1.7% of America’s population and it is no secret that the number of Jewish War Veterans is a tiny fraction of that small number. We cannot rely solely on membership dues to sustain our organization. You can ensure the survival of JWV’s legacy through your estate plan at no liftetime cost to you. Many of today’s American Jewish service men and women come from families in which fathers, brothers, sisters, and mothers have served and still serve. There is a proud family tradition of serving in uniform for Jews in America. We are part of a proud legacy, L’Dor V’Dor. My father served in WWII. When the war in Vietnam heated up, I told my father I planned to accept my commission as a medical officer in the U.S. Air Force. He was proud of his service as an active duty Army soldier. I am honored to continue my service, through the U.S. Army, to this day. We need you and your loved ones to help us expand our Legacy Program to Jews on active duty, to those who already served, and to Jews who didn’t wear the uniform but are proud of the service of their families and friends. By PNC Paul D. Warner, LL.M., Ph.D. In June 2016, The Commission on Care issued a 292-page document containing eighteen recommendations for the improvement of the operations of the Department of Veterans Affairs system. The one which has most interested the Administration appears to be the use of private doctors. Last year Congress passed a bill which they claimed would eliminate the arbitrary rules relating to when the VA would pay for the use private doctors by veterans. The old rules governing the use of private doctors were that the veteran would have at least a 30 day wait or a 40-mile distance to obtain care at a VA installation. The VA has proposed a 20 day wait for primary care or a 28 day wait for specialty care. The mileage requirement is replaced by a drive time standards which are 30 minutes for primary care or 60 minutes for specialty care. Clearly these are simply a new set of arbitrary rules. The only thing clear about the new rules is that they are less stringent and will probably allow more veterans to seek private care. Data provided by the VA shows that, currently, over about one-half the VA’s primary care sites have wait times longer the 20 days and specialty wait times longer the 28 days (there is some question about the reliability of this data). The expansion of private care will come at the expense of the VA’s own health system. The VA estimates that the cost for privitization will cost from $13.9 to 32.1 billion dollars over the next five years. It appears that this money will come the VA’s budget, not from additional federal funding. How many more veterans will be eligible for private care under the proposed standards? How will drive times be calculated? Will the greater availability of private doctors result in more veterans using this option instead of their private insurance or Medicare? Will veterans applying for private care get their appointments faster than at the VA? The unanswered questions could dramatically change the VA’s effectiveness and costs. There appears to be much pressure from the private sector to privatize the VA and make its funds available to for-profit organizations (e.g., private health insurance and pharmaceutical companies). In particular there are three private citizens who have the Department of VA’s ear. A Freedom of Information Act request and interviews with former administration officials revealed that they have been extensively involved in the VA’s policies and personnel matters. They have direct contact with the President who appears to be consulting with them about the VA. They have not followed the Federal Advisory Committee of 1972 which controls the activities of non-governmental advisors. It does not look good for the VA and this is why many veterans’ organizations including Jewish War Veterans, American Legion and Veterans of Foreign wars are opposed to the proposed changes. There is one “veterans” organization which supports them, the Concerned Veterans of America which is supported by organizations whose primary goal is to totally privatize the VA.
JWV National Executive Committee (NEC) members “stormed the Hill” February 13th and 14th, and met with their Senators and Representatives to discuss our key legislative issues. Led by National Commander Dr. Barry J. Schneider, our leadership walked the halls of Congress wearing their JWV caps and recommitted our support for all veterans. For the most part, JWV’s key issues are developed by our Resolutions Committee and then voted on at our National Convention. Our NEC members, who converge upon Washington, D.C., from throughout the country, study the issues. For example, our New Jersey delegation met with the legislative staff of Senators Cory Booker, Bob Menendez, Congressmen Tom Malinkowski, Bill Pascrell, Albio Sires, and Chris Smith. They met with and had their picture taken with Congressmen Van Drew, Malinkowski, Pascrell, and Smith. The JWV Florida delegation met with Congressman Brian Mast, a veteran of the war in Afghanistan. Of special interest to JWV, Congressman Mast volunteered with the Israel Defense Forces, working at a base near Tel Aviv, packing medical kits and moving supplies. 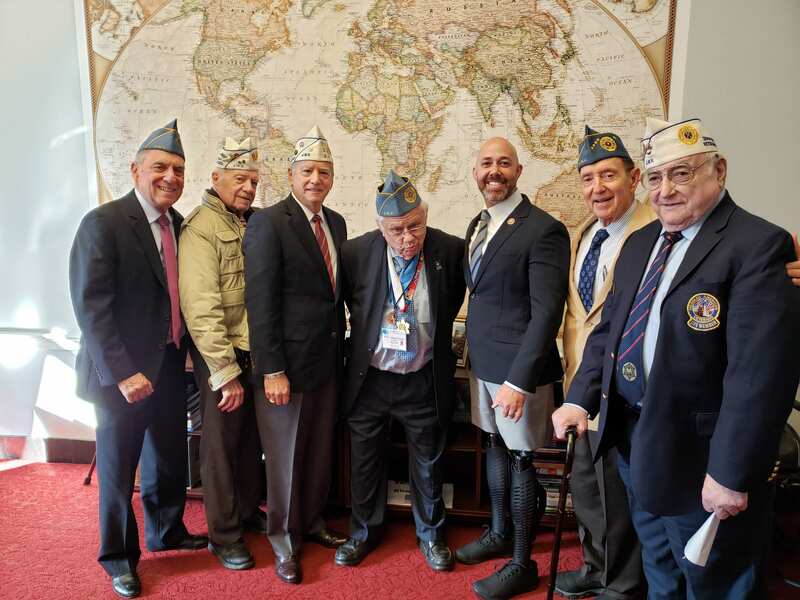 Pictured from left: PNC David Magidson, PDC Richard Rosenzweig, DC Alan Paley, PNC Ainslee Ferdie, Congressman Brian Mast, PNC Dr. Robert Pickard, and PDC Gerald Rennert. In speaking with many of our legislators we were able to express our concern regarding Rep. Omar’s anti-Semitic comments and many of our Congress members shared with us their comments and statements on this issue and JWV issued a strong press release regarding Rep. Omar. Our Florida delegation hit the Hill with 20 confirmed appointments. In each Senate and House office, the Florida group discussed three categories of topics – the military, Israel, and veterans. Additionally, they spoke about support for Israel, and this year, they spoke in detail about the anti-Semitic remarks recently made by one of the new members of Congress. The Florida delegation closed by speaking about veterans issues. They handed a copy of JWV’s Legislative Priorities to each member and then went into detail about concerns that one or more of JWV members have with either veteran’s benefits or the Veterans Administration. The Florida contingent is always well received, and every legislator that they met with thanked us for our military service. Capitol Hill Action Days are two very exciting and intense days. It is an opportunity that I urge every member of JWV to experience, at least once. During our Capitol Hill Action Days, PNC Dr. Robert Pickard arranged a JWV visit to the Office of the Secretary of the VA, the Honorable Robert Wilke. While not on the Hill, the VA’s backing is crucial to the passage of many legislative proposals. The JWV group met with 7 lay VA executives, led by Jason Beardsley, a Special Assistant to Secretary Wilke. JWV Capitol Hill Action Days fully conclude when NC Schneider presents JWV’s legislative priorities to a joint session of the House and Senate Committees on Veterans Affairs. Jewish have served in the American armed forces since the Revolutionary War. During war and peace time, rabbis have marched, sailed, or flown along with our brave American troops, caring for both Jews and Gentiles. There are Jewish chaplains on full-time active duty and others with both Reserve components, either Reserve or National Guard. Only the Army and Air Force have both Reserve and National Guard, Navy and Marines only have the Reserve. What do Jewish chaplains do? Pretty much the same as any chaplain, regardless of religious denomination. We all care for the living, we also counsel, visit, or tend to those in need, or the most sacred work, honor the dead. We do both staff officer and clergy work. When I was deployed to Afghanistan the second half of 2011, I was on my commanding general’s special staff, and I was the only Jewish chaplain in the entire operational theater. One of the most memorable experiences I had was leading a Hanukkah Menorah lighting on my base, Camp Phoenix in Kabul. On a cold, wintery night, twenty-five people gathered around a five foot Hanukkiyah I had specially built. We were from all branches of service as well as government contractors. Not everyone who attended was even Jewish. I was proud to lead them in the blessings and songs. We finished up by feasting on latkes and sufganiyot (jelly donuts). This scene was replicated all over the world on military bases or ships by Jewish chaplains or lay leaders. All were serving our nation as Jewish military personnel. Presently, I’m serving on active duty at the National Guard Bureau in Arlington, VA, after being a full-time pulpit rabbi for 25 years. For most of my military career I was part-time in both the Massachusetts and New York Army National Guard. I was a “weekend warrior…minus Shabbat.” I, like many Reserve Component rabbis, held other positions like pulpit, education, or hospital chaplaincy. When in uniform, I delivered prayers at many military ceremonies, or did counseling, or even gave the hamotzi at JWV events. In my present role, I’m overseeing the religious response mission of the National Guard’s domestic response or its State Partnership program with other nations’ armed forces. Luckily, I still get to teach some Jewish text or lead Hanukkah celebrations at the Guard Bureau or even at the Pentagon. This coming April will be 30 years since I raised my right hand in the Jerusalem Consulate of the United States Embassy and took an oath to support and defend the Constitution of the United States as an army officer. Ever since that sacred moment, I’m proud to wear the uniform of an US Army officer. I’m proud to wear the Jewish chaplain’s tablets on my uniform. I’m proud to be military combat veteran, and I’m proud to stand shoulder to shoulder with my fellow Jewish War Vets, all of us, members at one time, of our United States military! For God and Country! Chaplain (COL) Larry Bazer is the Deputy Director of the National Guard Bureau-Office of the Joint Chaplain. Prior to serving on active duty, he was the Joint Forces State Chaplain for the Massachusetts National Guard and the rabbi of Temple Beth Sholom in Framingham, MA. He is still a proud member of Framingham/Natick JWV Chapter and MA Jewish War Veterans. https://www.jwv.org/wp-content/uploads/Hanukkah-in-Kabul.jpg 1536 2048 Iryna Apple https://www.jwv.org/wp-content/uploads/jwv-logo.svg Iryna Apple2019-04-11 15:29:032019-04-11 15:38:37Wow, you’re in the Army? I didn’t know that Jews serve in the military. 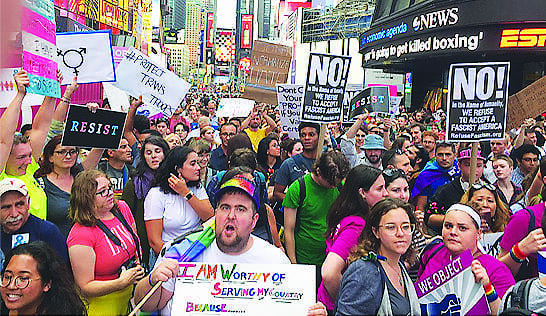 A protest held July 26, 2017 in Times Square outside the U.S. Army Recruiting Center in response to President Trump tweeting that transgender people would no longer be allowed to serve in the U.S. military. Photo by Jere Keys, New York City, USA. Jews, as a community, have always been willing to fight for this country, even prior to its official beginning. Over 360 years ago, when those first 23 Jews came in 1654 from Recife, Brazil, to settle in New Amsterdam, now known as New York City, they were not welcomed by Governor Peter Stuyvesant, he of the well-known peg leg. Nevertheless, they were allowed to stay and some months later, Asser Levy, one of the initial 23 Jewish immigrants, protested to Stuyvesant that Jews were not allowed to stand guard. According to Stuyvesant, the reason why he did not want a Jew to stand guard was because of the discrimination and unwillingness of local residents to serve as fellow soldiers with the Jewish nation and to be on guard with them in the same guard house.Levy insisted however, that, as a manual laborer, he should be able to stand guard like everyone else. Levy appealed to some of the Jewish shareholders of the Dutch East India Company, which owned New Amsterdam and, within two years, Levy had succeeded in standing watch and ward, like the others. On July 26, 2017, President Trump announced in a series of tweets that transgender troops would no longer be allowed to serve in the military, reversing the policy of the Department of Defense. A formal Presidential Memorandum followed on August 25, 2017. JWV National Commander Carl A. Singer issued a statement on behalf of the JWV opposing this new discriminatory policy. Suit was brought by the transgender community in the United States District Court for the District of Columbia to prevent the Trump Memorandum and its subsequent progeny from being implemented. Doe v. Trump, CA No. 17-1597 (CKK). A preliminary injunction was issued preventing this discriminatory policy from going into effect. This injunction was overturned by the U.S. Supreme Court in January. The Trump administration has appealed to the United States Court of Appeals for the District of Columbia Circuit on the merits. The JWV was asked by Mary Bonauto, the “Thurgood Marshall” of the LGBTQ movement, if it would be willing to file an Amicus brief in light of Commander Singer’s statement and the JWV agreed. The JWV, along with several other veterans groups, filed a supporting brief on October 29, 2018 with oral argument expected to take place in December, 2018. However, the major veterans groups chose not to join in. The appeal focuses on the limits of the power of the President as Commander in Chief. Not needing to repeat this legal argument, the JWV brief focused on policy arguments. The proposed ban would make military units weaker, not stronger, because unit cohesion is the product of values and experiences shared by those who serve, and permitting openly transgender personnel to serve does not hinder unit cohesion, but rather enhances it. Furthermore, the proposed ban would arbitrarily exclude capable individuals who are willing to serve their country and would demean all who serve. A major reason for the transgender ban is undoubtedly similar to the reasons why Asser Levy was initially forbidden to stand guard over 360 years ago, (i.e., others who serve wouldn’t like it). And today, such discrimination based on religious or gender identity is forbidden by the U.S. Constitution. Levy would not have had to appeal to the Netherlands had his situation arose today. He would have had the rule of law on his side. The right to serve in the military is a value kept alive by the JWV. The Jewish War Veterans of the USA (JWV) strongly condemns the comments and hate-filled language espoused by Alabama 5th District Representative Mo Brooks. On March 25th, 2019, Representative Brooks quoted Adolf Hitler to describe the attacks that President Trump faced from “socialist Democrats and their fake news media allies”. He then proceeded to continue with an English translation of a passage on the strategy of the “big lie of the Jews” from his 1925 book Mein Kampf. These comments were factually incorrect and inappropriate. While all elected leaders as well as private citizens do have the right to make strong and impassioned comments, speeches and addresses about topics of importance, Representative Brooks’ comments deserve scrutiny and are highly inappropriate for any elected leader to use in a public forum. Representative Brooks espoused the hateful language of a fascist dictator who endorsed and ensured the systematic slaughter of innocent people. The citizens under Hitler’s regime were dehumanized and considered “inferior” by his administration, and this dehumanization was an important step towards the facilitation of mass genocide. The use of Mein Kampf passages in a manner other than for purposes of historical education, especially to deride political opponents, was completely out of line and unacceptable. We, The Jewish War Veterans of the United States of America, are requesting that Representative Brooks be reprimanded and/or censured for his comments. These comments do not reflect the values of this organization or our nation, nor should they ever.